What's next from the sci-fi exploration sim? No Man's Sky is about to launch another titled update for its high-profile space exploration sim - one that seems to be inspired by the spooky Halloween season. 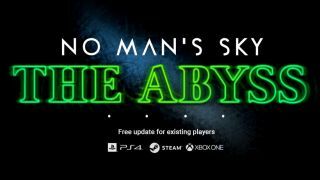 No Man's Sky: The Abyss was announced in a blog post by Hello Games founder Sean Murray, and promises to bring out some of the "eerier elements" of the game. It comes three months after the widely publicized 'Next' update, which was largely credited with turning No Man's Sky into the game players had expected at launch - adding new aliens, character customization, and the long-awaited inclusion of online multiplayer. Release of The Abyss update is expected "next week", presumably the day of or just in time for Halloween on Wednesday 31 October. While there's as yet no details on what The Abyss might include, the title may hint at some sort of underground (or underwater) exploration, or even the likes of a wormhole or another dimension. The font in the publicized image seems to echo that of the supernatural Netflix thriller Stranger Things, hinting at ominous forces beyond the alien creatures and enemies we've seen already. No Man's Sky has built its world - and its reputation - on its ability to procedurally generate environments for players to explore. The choice to possibly curate more of that content in seasonal events and updates in the vein of Fortnite, could do much to attract players and turn No Man's Sky into a game worth extending your stay in.